I launched a bloggers campaign and Twitter Wall of Fame as part of the Sharing Foundation's America's Giving Challenge. (To learn more about the Sharing Foundation, see this article) I've been reaching out to my network, and Vicky Davis is one of the people I turned to for to ask for help with the from her network of wired educators. Yes, I hope they will contribute the $10 so we can win the $50,000 (which will certainly help us make improvements to our computer school and the Sharing Foundation's many other programs), but I am also want feedback about how to improve a computer program in a rural village in a developing country with really slow Internet. I know it is difficult without being there .. The Sharing Foundation's Computer School was opened in 2006. Computer classes are held every morning utilizing donated laptops and desktops (that are hand-carried over by Dr. Hendrie on her quarterly trips) Students, picked by lottery, come daily for six weeks to learn word processing, spread sheets, and Internet use, on our one, slow connection, acquiring a useful skill for future employment. Computer education groups repeat on a rotating basis. I observed Mam Sari, our head English teacher (and computer geek) teach a Google search lesson and captured video above. Mam Sary gets on the Internet via his cell phone connection which costs the Foundation roughly $28 per month. It's slow, but he is able to teach a lesson to the students about how to find supplementary materials for their school assignments. One of the students asked if Google was the best search engine. Mam Sary said, 'Yes, Google is the best." This is amazing because during my last trip in 2004 when I taught ESL, these students gave me a blank stare when I mentioned the words computer and Internet. Mam Sary also received several of the video cameras Jay Dedman and Ryanne Hodson brought over to Cambodia last July donated by Doug from the video blogging community. (Jay and Ryan not only created this fantastic video about the Sharing Foundation's projects, but have also donated and asked other video bloggers to support the cause.) Jay and Ryanne taught him how to use the camera and I helped him again a month later when I was there. That is Mam Sari. 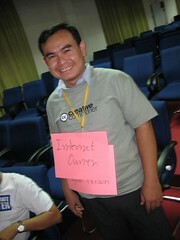 He attended the Cambodian Bloggers Summit with me. We participated in a small group role play exercise. Our group was assigned to "Social Media." First we discussed the definition of the term. It became clear that social media in Cambodia means "any media that can solve social issues." Mam Sari was thrilled to learn about the Web2.0 and is very interested incorporating some of the ideas into his instruction, but unfortunately our very slow Internet connection doesn't make it easy. He has set up a blog and has a Facebook profile, but to update them he has to ride his motorbike an hour into Phnom Penh. The connection is to slow for blogger or Facebook to load. If we had a better Internet connection (very expensive to get high speed Internet in our rural village), we could do more. For example, English lessons on Skype with students in US, post some of the videos created with the cameras on Youtube, use his digital tape recorder to create podcasts, student blogs, etc. What advice would you offer to Mam Sary about incorporating computer instruction on a REALLY slow connection and with one computer connected to the Internet? Are there any web resources or books that you think I should send over to him to read? Dream a little dream with me, if we had a fast Internet connection, what are the possibilities? There has already been over $19,000 for the Sharing Foundation's America's Giving Challenge raised through the unselfish giving of over 650 people like Jay Dedman, Ryanne Hodson, and Coffee with Doug. If you have not yet donated $10 (or more) to this important cause, there is only a few days left to donate and change a Cambodian child's life and maybe help us get a faster Internet connection! This is a great problem to think about because it affects so many more people in the world. The problem with tethering cell phones to get access is the slow connection Mam is experiencing. The only suggestion I have regarding that is to check different providers for the fastest possible data speeds you can find. I have no idea what Cambodia has to offer in that regard. The other option is to use an offline browser for most of your pre-thought-out curriculum. So, for instance, if you have the computer in a location which has broadband, set the cache amount on your browser really high, or get a tool for offline browsing, and then browse around the web using your curriculum as a map on what to do and where to go. Then, when you take the computer into remote locations, the images, etc which usually take the longest time to load would come from your computer rather than transfer over the wire. Unfortunately, some "web 2.0" sites would work only sporadically using this method because of how they do things on those sites, but it still might significantly speed up the usage as a whole. I'll be thinking of any other methods that might work, but those are the best things I can come up with off the top of my head at the moment.